(Sunflower, Wild (Helianthus spp.) - 01) There are about 60 species of wild sunflowers in the United States, 40 of which are located east of the Rocky mountains, with most of them being concentrated in the Plains States. One of our references correctly stated that the various species are difficult to distinguish, and we have found that to be true. 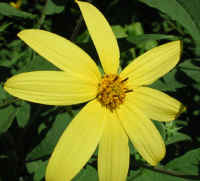 Therefore, we have listed this wild sunflower without a specific species. In searching the Internet, we found several species that seemed to match; and different "experts" seemed to give different species names to what appeared to be the same species. (Sunflower, Wild (Helianthus spp.) - 02) This wild sunflower had only one composite flower, but it's an excellent example to show the leaves, which grow alternately from the stem. (Sunflower, Wild (Helianthus spp.) 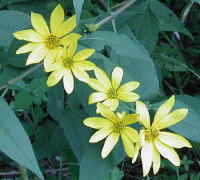 - 02a) This photo gives us a closer look at the wild sunflower's broad lanceolate leaves with toothed edges. (Sunflower, Wild (Helianthus spp.) 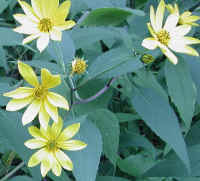 - 02b) Wild sunflowers have between 10 and 25 ray flowers. This particular species seems to be on the lower end, having 12 ray flowers. 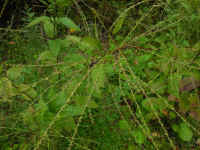 This photo also provides another close-up of the leaves. (Sunflower, Wild (Helianthus spp.) 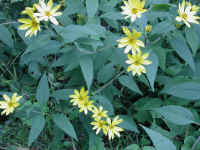 - 03) This is another view of the wild sunflower blooms and leaves. 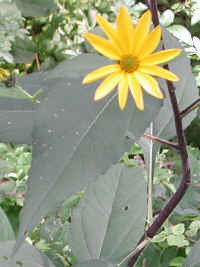 Most wild sunflowers grow to heights of 2 to 6 feet. (Sunflower, Wild (Helianthus spp.) 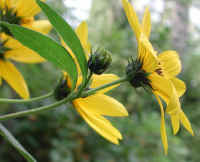 - 03a) In this photo of the wild sunflower, the sunlight and contrasting shadows allow us to see the fine hairs that grow along the edge of the leaves and on the stems. (Sunflower, Wild (Helianthus spp.) 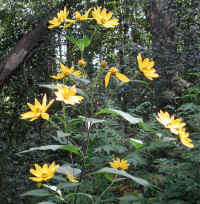 - 04) This stately, six feet tall wild sunflower grew between the road and the woods near our home. (Sunflower, Wild (Helianthus spp.) 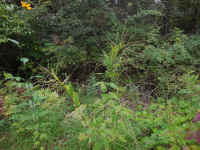 - 05) This is another patch of wild sunflowers that was growing along the side of the road. The ones in the background are still upright, but the ones in the foreground have fallen over. (Sunflower, Wild (Helianthus spp.) - 06) This is a closer look at the wild sunflower bloom. (Sunflower, Wild (Helianthus spp.) 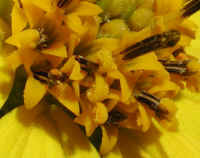 - 07) In this photo we can get a closer look at the central flowers of the wild sunflower. Composite flowers are not single flowers, but a composite or grouping of many flowers to make what would appear to be a single larger flower. The structures that look like petals are really ray flowers, and if we look closely, we can see the individual central flowers. (Sunflower, Wild (Helianthus spp.) - 08) In this bee's eye view of the central flowers of the wild sunflower, the individual flower structures are easier to see. (Sunflower, Wild (Helianthus spp.) 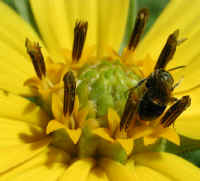 - 09) This is an even closer bee's eye view of the central or disc flowers of the wild sunflower. Several of the unopened flower buds can also be seen. (Sunflower, Wild (Helianthus spp.) 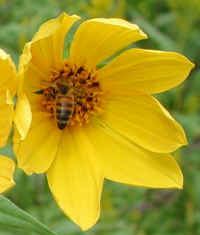 - 09a) This is another bee's eye view of some of the central or disc flowers of the wild sunflower. (Sunflower, Wild (Helianthus spp.) - 10) More wild sunflowers! (Sunflower, Wild (Helianthus spp.) - 10a) This is a closer look at one of the clusters of wild sunflowers. We found it interesting that the bloom on the right had only nine ray flowers. (Sunflower, Wild (Helianthus spp.) 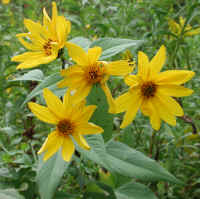 - 10b) This is another cluster of the wild sunflower blooms. These also have fewer than 10 ray flowers, which the literature stated was the minimum number. 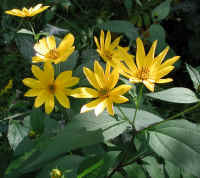 Going from upper left to lower right, the first two have 9 ray flowers each, the next three have only 8 ray flowers each. (Sunflower, Wild (Helianthus spp.) - 10c) This is another cluster of wild sunflowers. The top left bloom has 12 ray flowers, while the one below it has only 9 ray flowers, and the bottom one has 10 ray flowers, as does the bloom on the right. Also of interest are the bloom going to seed and the bud. (Sunflower, Wild (Helianthus spp.) 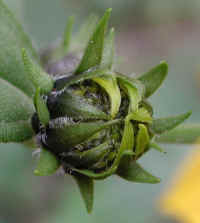 - 11) This is a close-up view of a wild sunflower bud. Note that the sepals are smooth with hairy edges. (Sunflower, Wild (Helianthus spp.) 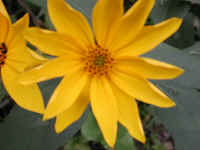 - 12) This is a side view of the bloom of the wild sunflower. (Sunflower, Wild (Helianthus spp.) - 13) In this close-up side view of the wild sunflower, we can see the details of the bract and the profile of the ray and disc flowers. (Sunflower, Wild (Helianthus spp.) 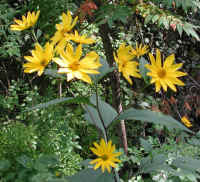 - 14) We found this wild sunflower plant growing near the side of the road in a patch of goldenrod. (Sunflower, Wild (Helianthus spp.) - 15) This is another patch of wild sunflowers. If we look closely at this photo, or at the next couple of photos, we can see that the "Sunflower Restaurant" has begun to serve lunch. (Sunflower, Wild (Helianthus spp.) 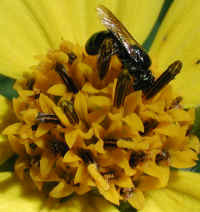 - 15a) The insect that has come to lunch upon this wild sunflower appears to be a Japanese beetle. Unlike the bees, wasps, and butterflies who come to dine upon the nectar and pollen that is served, the Japanese beetle eats the "restaurant." (Sunflower, Wild (Helianthus spp.) - 15b) This bee has come to dine upon the wild sunflower's gourmet offerings of nectar and pollen, and before leaving, she always leaves a generous "tip" of pollination. (Sunflower, Wild (Helianthus spp.) - 15c) The fact that most of these disc flowers have bloomed shows that this is a more mature wild sunflower bloom. (Sunflower, Wild (Helianthus spp.) - 15d) In contrast to the previous photo, this wild sunflower's disc flowers are just beginning to bloom. (Sunflower, Wild (Helianthus spp.) - 16) This is another patch of wild sunflowers that we encountered just off the side of the road. (Sunflower, Wild (Helianthus spp.) 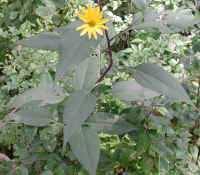 - 17) This is another wild sunflower plant. Note that the right bloom appears to have 13 ray flowers. 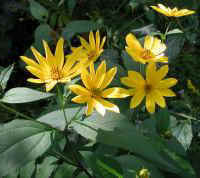 Thus far, we have seen this species of wild sunflower with from 8 to 13 ray flowers. (Sunflower, Wild (Helianthus spp.) 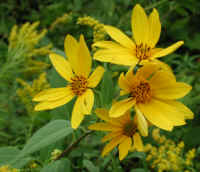 - 18) This is another cluster of wild sunflowers, two of which have 12 ray flowers. (Sunflower, Wild (Helianthus spp.) 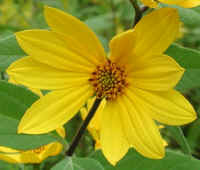 - 19) This is one of the wild sunflowers with only eight ray flowers. The actual size of this bloom is about two inches in diameter. 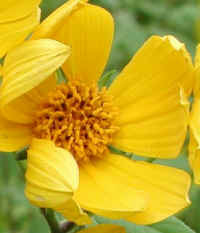 One reference indicated that the wild sunflower was considered sacred, as it was an earthly symbol of the sun. (Sunflower, Wild (Helianthus spp.) - 20) This is another bee's eye view of the disc flowers of the wild sunflower. (Sunflower, Wild (Helianthus spp.) 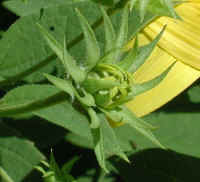 - 20a) This is a closer view of some of the disc flowers of the wild sunflower. (Sunflower, Wild (Helianthus spp.) 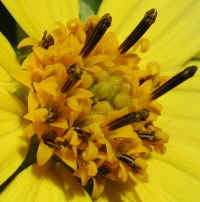 - 20b) This is another close-up view of the disc flowers of the wild sunflower. (Sunflower, Wild (Helianthus spp.) 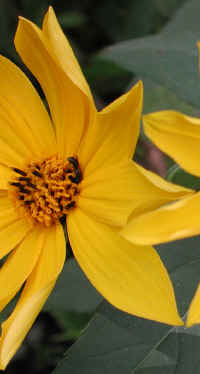 - 21) This insect has come to investigate the opening of the first disc flowers of this wild sunflower. (Sunflower, Wild (Helianthus spp.) - 22) This little wasp has come to dine upon the "goodies" being served from these wild sunflower disc flowers. (Sunflower, Wild (Helianthus spp.) 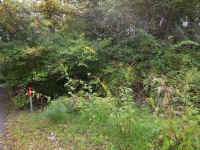 - 23) This photo presents a comparison between newly opening and fully open wild sunflowers. (Sunflower, Wild (Helianthus spp.) 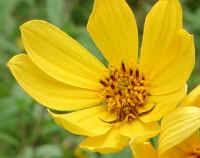 - 23a) This is a side view of one of the newly opening wild sunflowers. (Sunflower, Wild (Helianthus spp.) - 24) This is another patch of wild sunflowers, many of which are just beginning to open. (Sunflower, Wild (Helianthus spp.) - 24a) We noticed a considerable difference between the way the sepals have almost completely opened on this wild sunflower, and the partial opening of those we encountered with other wild sunflowers. See photos 11 and 12 for comparison. (Sunflower, Wild (Helianthus spp.) - 25) In 2017 we saw another wild sunflower anomaly in this patch which we had enjoyed looking at for many years. Almost all of these sunflowers developed frilly tops instead of the normally present flowers. (Sunflower, Wild (Helianthus spp.) - 26) In the upper left of this photo is one of the only wild sunflower plants in this cluster to develop the normal sunflowers. This sunflower is also taller that the ones with the frilly tops. (Sunflower, Wild (Helianthus spp.) 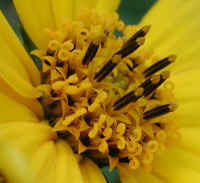 - 27) This is a closer look at the top of the sunflower plants with these long tendrils of what appear to tiny flowers. This was the first time that we had ever seem this phenomena in more that 40 years of observing these flowers at Sleepy Hollow Lake. (Sunflower, Wild (Helianthus spp.) 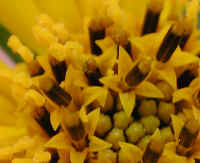 - 27a) This is a close up look at the top of one of the wild sunflower plants with these long strands instead of the flowers we normally see.